Midland Cb radios - Excellent service, lowest prices, repair, warranty, tuning and fast world wide shipping on the latest Midland Cb radios. Midland Cb radios now have a 3 year manufactures warranty. All of our Midland Cb radios come with a factory microphone, power cord, mounting bracket and mounting hardware. We also have some Midland hand-held radios listed under "Cb radio hand-held" in the left menu Cb Radios category. Don't forget to add our $30 tuning. If anyone other than GI Joe's tunes or works on your Midland Cb radio that does void your warranty with us. Tuning includes aligning the receive, transmit, meters, any other necessary adjustments and a visual inspection of the Cb radio. Once we have tuned your Midland Cb it will likely never need retuning. If you do encounter a problem you should contact GI Joe's first for help or instructions. On the Midland Cb radio "View Detail" pages you will find more information and tuning selections. Also there are options to make the Galaxy Cb radio a base by adding a 120Vac to 12Vdc power supply. The smallest power supply listed is the smallest one that will run the Cb radio. You will only need one of the larger power supplies if you plan to run more equipment with higher current (Apmerage) demands. As there are not a lot of base Cb radios on the market the mobile Cb radio with external power supply option gives you more for your money (as compared to a base Cb radio) and a better selection of Cb radio features to fit your needs. **ORDERING TIP: Shipping cost per item drops a great deal as you as you add more items. Example: 2 mobile Cb radios only cost $4 to $7 more to ship than one Cb radio. Adding a Cb antenna with a Cb radio often only ads $3 to $5 to the shipping cost. You can save some money on shipping by ordering everything you need at once. The more you order the less shipping you pay per item. Excellent service, lowest prices, repair, warranty, tuning and fast world wide shipping on Midland Cb radios. The Midland 1001z is a good compact low cost radio. If your looking for a cheap Cb radio this is a decent Cb for the price. Check out our Wilson Magnet mount Cb antenns to go with it. The Wilson Lil Wil 3' magnet mount is a good low cost antenna and it comes with 18' of coax cable. Increase your range with a longer Cb antenna and/or our $30 tuning option. Midland Cb radio 40 channels. 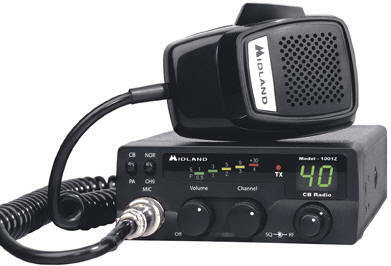 Midland 1001z low price Cb radio. Tuning, and talk-back available for Midland Cb radios. Mobile or base options. Use it in the home with our PS7Kx 120Vac to 12Vdc power supply on the right side options on the View Detail page. consumer electronics, cellular, cell phone, cingular, sprint, t mobile, nextel, trucking industry, trucking jobs, trucking employment and truck driver radios.